A backpacking trip to India 21 years ago has slowly morphed into a deep relationship with textile artisans & tailors in this colorful country, as well as a small but vibrant business in Oakland's Rockridge district. 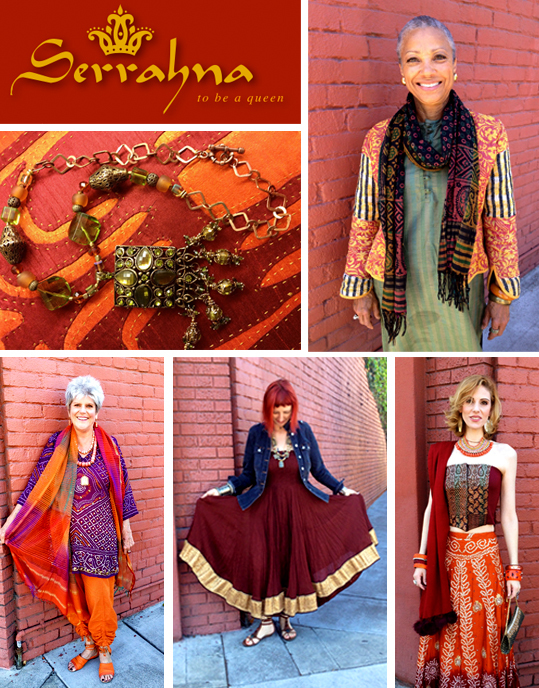 Serrahna embraces the traditions of India's textile experts and transforms the embroideries, tie & dye silks, hand block prints, & handlooms into contemporary wearables.We provide colorful & textural contrast to typical western dress, yet are silhouettes are in sync with a western lifestyle. We are pleased to dress women of all shapes, sizes, colors & ages. In India, Andrea Serrahn creates one of-a-kind sweaters & jackets from recycled woolens combined with local hand-worked fabrics. Her 2 tailors are provided a roomy workshop & machinery, while their stay at home wives, stitch the mirrors & bead work in these collaborations. Andrea's efforts to revitalize many disappearing textile arts are paramount to both the artisans & the crafts' survival. Andrea's craftspeople set their own prices. This empowers her workers to enjoy a lifestyle exceeding local Indian standards..